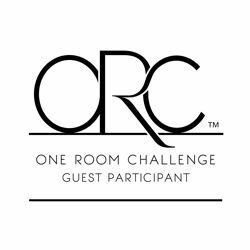 Today is an exciting day as we launch the first day of the One Room Challenge hosted by Calling It Home. For this exciting six week challenge, I have decided to transform my teenage son’s room from a functional space into a cool teenage friendly bedroom that he can be excited about. Follow along each week as I give updates on the room transformation and showcase what we are working on. This will be my third One Room Challenge. My first challenge was our master closet and my second challenge was our pantry. There comes a time in every momma’s heart when she realizes her littles are growing up. Right before her very eyes. Somewhere between sleepless nights and first days of school, this crazy thing we call puberty hits and that little boy isn’t so little anymore. Suddenly he is taller than you and not so excited about getting hugs from mom. I don’t know about you but these are hard days for this momma. Sometimes I wish I could freeze time and keep them little just a while longer. Each day with them I feel so blessed to by their momma. Watching them grow is such a gift that I never want to take for granted. Last spring our son turned 13. This always feels like such a milestone as we watch our babies turn into teenagers. His special birthday happened right in the middle of our big move from Minnesota to Tennessee. With so much transition all at one time, it feels like the perfect time to give him a special place of his own. 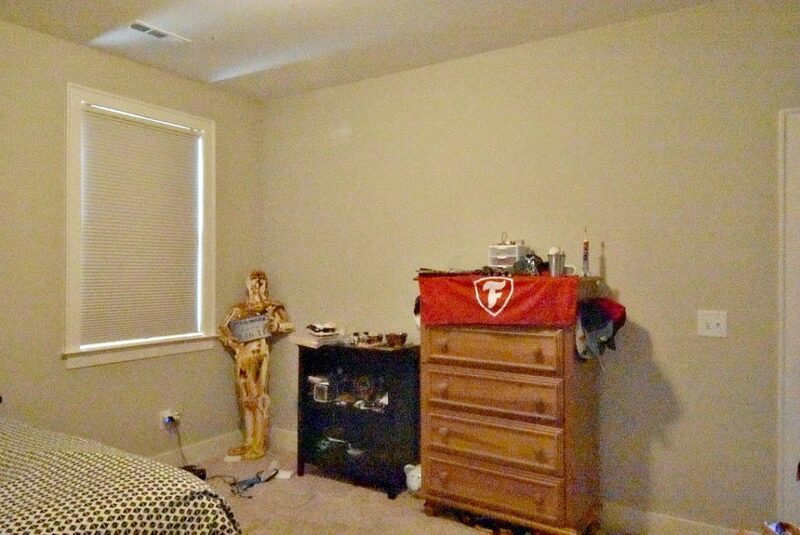 I thought creating a cool teenage friendly bedroom would be a great way to help him transition into his new space, new school, and new life in Tennessee. We moved into our home three months ago. At that time, we simply placed the basic furniture into our son’s room. It is functional but not really much fun and nothing to get excited about. Are you ready for the scary before photos! Before photos are not supposed to be glamorous…right! As you can see the space is pretty basic. Not a single thing on the walls and the bed shoved in the corner. The remaining wall has a dresser and book case for now. Totally boring right! 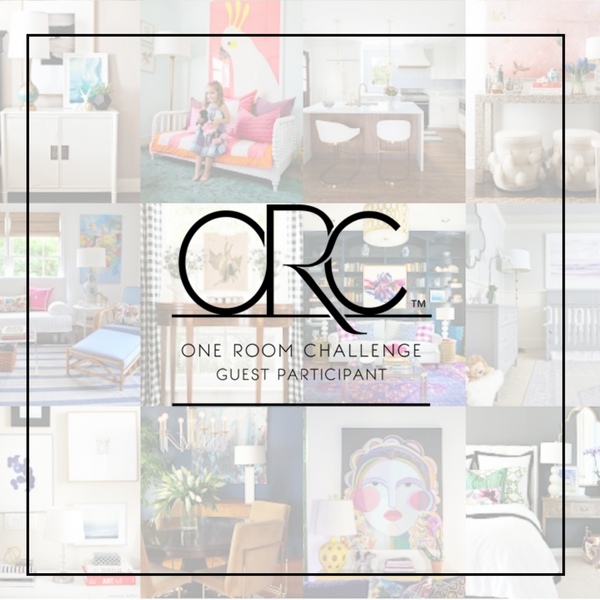 Ready to see some of my inspiration for this One Room Challenge! I have selected Sherwin Williams Repose Gray as the main color for the room and will be creating an accent wall with Sherwin Williams Iron Ore.
2) These industrial shelves are a great starting point for the room. I love the look and believe they will make a fun addition to the room. 3) I found a business in our local area that has reclaimed barn wood. 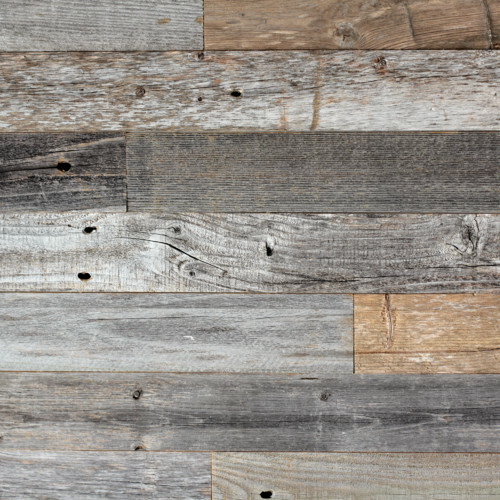 This was an exciting discovery and I can’t wait to incorporate some barn wood into the space. 4) My son has requested a ceiling fan for his room. While ceiling fans are not a favorite for this decorating momma, I know how important the fan can be for his comfort in this upstairs space. I am still on the look out for a great fan that will fit this space. 5) I also need to make some decisions on his bedding. We may keep his current bedding because I think it could work or we may go with something else. I guess it will be determined by the budget as the project commences. 6) He will be starting high school next year so we would like to create a desk space for him. Wish me luck as I begin this One Room Challenge transformation and don’t forget to check back each week to see the progress we are making. I can’t wait to see this room come to life! « Halloween Table- A Blog Hop To Inspire You! I love your design and can not wait to see the progress! Good luck my friend! Thank you friend! Can't wait to turn this room into something fabulous! I feel your pain. Mine is 17 now. I love your vision for this room and I can't wait to see the reveal. Good luck with the makeover! Thank you friend! Why do they have to grow up so quickly!!! Ooh! 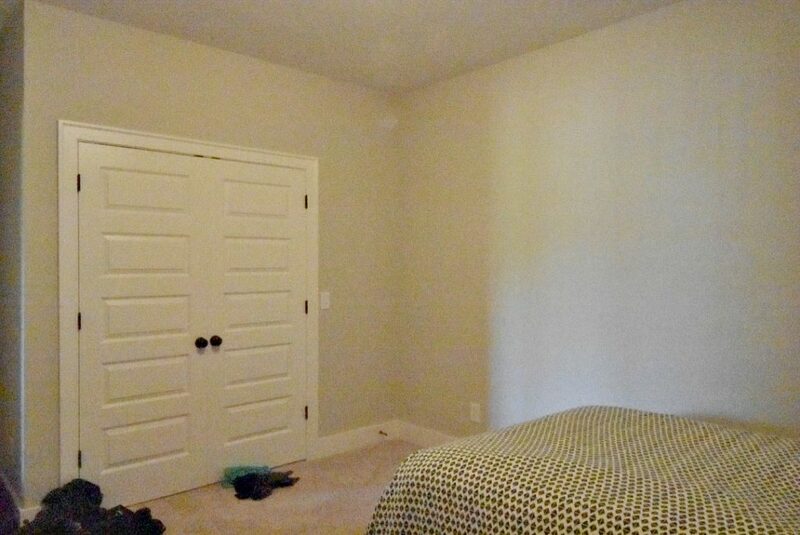 Can't wait to see what you do with this room! It will be a wonderful retreat for your son! Thank you Jen! Can't wait to create a cool space for him!! Hi Lynn, I think C3PO is about to get a new home. My oldest son has already claimed him for his Star Wars room in his new house. Not sure how it happened but I raised several crazy Star Wars fans! You are definitely working with a blank slate there! But you've also got the perfect design plan in place. I can't wait to see how it turns out! Hi Leslie, Yes...it truly is a blank slate! 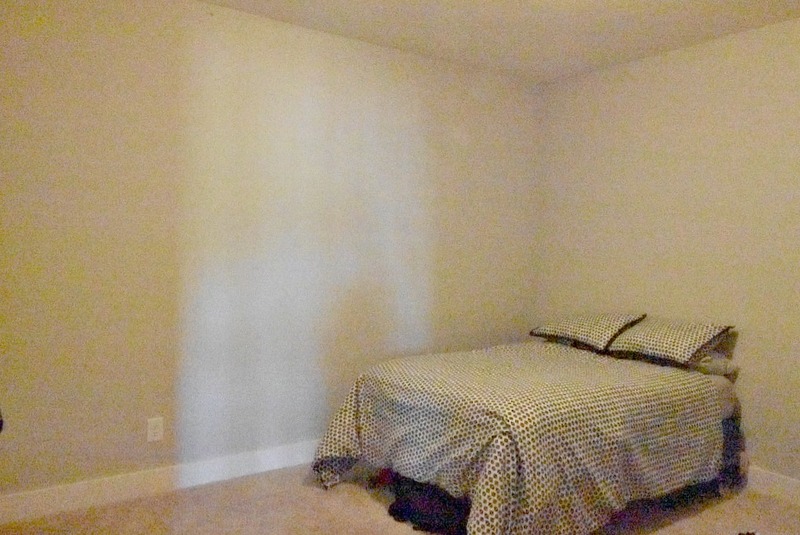 Kind of a sad little room to start with! Can't wait to pull it all together! What a wonderful momma you are!! I remember when my son turned 13...I was a mess, I think I cried off and on for...who am I kidding, I still do. It is so hard to let them grow up! I can't wait to see the wonderful space you create for him!! From one momma's heart to another...you get it. Why is it so hard for us mommas to watch them grow up! I am still a little startled when this young man walks into a room. Every time I think to myself...gosh...he isn't a little boy any more! Love the wall inspiration! Your son is going to love it. I can't wait to see the final result. Thank you Libbie! I am so excited to work on this space for our son! Tammy, That room looks familiar...lol! It's going to look fabulous once you finish with it. Can't wait to see it! Hi Laura, Gosh...why do they have to grow up so fast! I am so excited to create this space for our son! Sadly it will probably be the last room I get to create for him before he leaves the nest. I love your plan! Good luck with the One Room Challenge! Thank you Jessica! So excited to start pulling it together. I'm doing my little guy's bedroom this ORC too! Mine is only 8 but I haven't touched his room since he was 3, so time for an update for sure. I'll be sure to check back in on your makeover and cheer these Boy Bedroom Makeovers on :) Best of luck! Thank you Kristin! I think kid rooms are always my favorite!! I am gonna go check out your ORC now! Anxious to see the final reveal! The shelves and reclaimed wood is going to look awesome! Thank you Ruthie! I am so excited to work on this space!!! Exciting times, yet so scary to think about- my little guy is 2 and a half and man had time flew by- I can’t even imagine 13! It’s so fantastic that you will be taking on his room for the challenge- what a special treat for him! Good luck and I’ll be cheering you on! 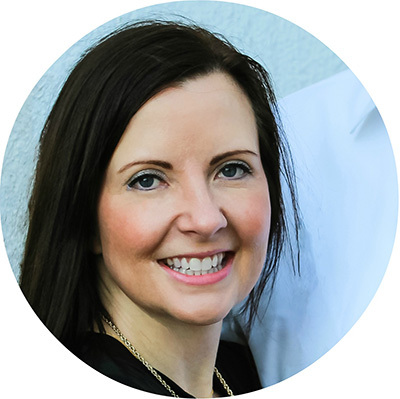 You have a fabulous blank slate to work with! I love the elements you are planning to add to his room! He is going to be so happy in this new bedroom when it is all finished! Thank you Nicki! It really is a blank slate which made it so easy when thinking about which room to work on! I can't wait to work on this room! I totally understand the feeling of wanting to keep them young. Time goes by so quickly! I cant wait to see you transform his room - your plans for the room look awesome! Thank you Jenny! It is such a blessing to watch them grow into young men. Just wish it didn't happen so quickly!! !